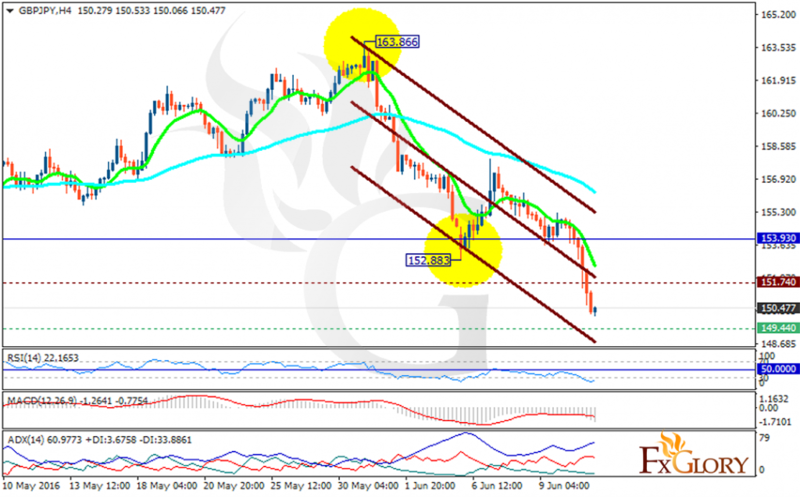 GBPJPY has been moving with bearish bias since the previous high at 163.866. The support lies at 149.44 with resistance at 151.74 which both lines are below the weekly pivot point at 153.930. The EMA of 10 is moving below the EMA of 75 with bearish look as well. The market closed last week with a hammer shaped candle and today it continued its downward trend. All indicators are signaling price decline, the MACD indicator is in negative territory, the RSI is below the neutral zone and the ADX is showing strong sellers. However, as there is a chance that the next candle closes with bullish look, there might be a rebound at any time soon. The support level breakthrough can push the price to lower levels targeting 147.01.